Today in Masonic History Willis Arnold Gorman passes away in 1876. Willis Arnold Gorman was an American politician. Gorman was born on January 12th, 1816 in Flemingsburg, Kentucky. In 1835 the family moved to Bloomington, Indiana. Gorman attended Indiana University there and graduated from their law school that same year. He immediately opened a private practice. In 1837, Gorman entered politics, first becoming the clerk of the Indiana State Senate. In 1841 he was elected to the Indiana House of Representatives, serving from 1841 to 1844. In 1846, Gorman enlisted in the United States Army as a private. He served during the Mexican-American war and saw combat in many battles. Eventually he was appointed as a major in the 3rd Indiana Infantry. By the end of the war he had risen to the rank of colonel. He was appointed as the civil and military governor of Puebla in 1848. Later that year he returned to Indiana. In 1849 Gorman was elected to the United States House of Representatives. He served from 1849 until 1853. In 1853, he was appointed the Territorial Governor of Minnesota. During his time as Territorial Governor he attempted to move the capital of the territory from St. Paul to St. Peter where he had land that would be used to build the new capital. The bill was taken by legislator who did not return it until minutes before the legislative session ended. His term as Territorial Governor ended in 1857. The following year he was elected to the Minnesota House of Representatives, serving one year. 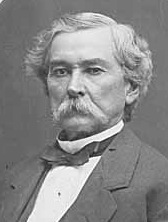 Gorman re-enlisted in the United States Army as souther states began to secede. During the Civil War he rose to the rank of Brigadier General. He served in various battles including the First Battle of Bull Run and later the Battle of Antietam where his unit suffered heavy losses. In 1864, Gorman left the military service and returned to private practice in St. Paul, Minnesota. In 1869 he was elected city attorney and held that position until the time of his passing on May 20th, 1876. Gorman was a member of Federal Lodge No. 1 in the District of Columbia.